I feel a whole lot better this weekend! It’s funny, every time I get sick or injured, I always seem to trip back to the sixties. I guess forced relaxation can do that to some people… On that note, I’m going to take it easy this weekend. In the meantime, here’s a post from last year you may enjoy if you missed it the first time around. My brother knew his cue… Late at night when he heard our father snoring; he would grab his guitar from underneath the bunk bed and begin to play… On most nights I would only pretend I was sleeping. I would listen as he would re-create the sounds he had earlier spun on our console stereo system. It always sounded perfect to me… Not too shabby for a 14 year old guitar player! I remember three volumes of an LP called Chicago The Blues Today! My first recollection of Otis Rush is from that album. Along with many others, Otis will always be a part of my earliest musical memories. Chicago The Blues Today! represented the first time that many people were introduced to the sounds of Muddy Waters, Junior Wells, James Cotton, Otis Spann, Buddy Guy and of course Otis Rush… He pioneered what was known as The West Side Sound and this album is a perfect example of that era. One of the tunes I recall my brother playing in the middle of the night was from that LP. 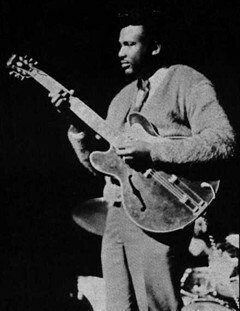 The song in particular was called “I Can’t Quit You Baby.” It was the first single and a vehicle for arranger/producer Willie Dixon to launch both Otis Rush’s career and Cobra Records. Led Zeppelin did their take on the song on their 1969 debut self entitled album. Zeppelin regularly performed the song at concerts around 1968 to 1970… As well as so many other performers such as Buddy Guy & B.B.King, and Gary Moore. was born one of seven children in April 29, 1934, in Philadelphia, Mississippi …He sang occasionally in the church choir, but remained drawn to the country blues sounds of Tommy McClennan and Lightnin’ Hopkins. In the winter of 1948 Rush went to Chicago and stayed with his sister. While working in the Chicago stockyards, he played harmonica and was inspired by watching Muddy Waters and Jimmy Rogers perform. Rush then began to study the guitar in 1953. A year later, he fronted a band under the name of “Little Otis.” He played his first job with Arkansas-born guitarist Bob Woodfolk. Otis was self taught and plays his right handed axe left handed and upside down without restringing it. It certainly contributed to his unique sound. Rush combined his Mississippi roots with modern urban styles of the time. He produced a solid soulful sound with vocals that were capable of really wild falsetto shouts. During the sixties blues revival, Otis emerged as a guru to many well known musicians. Even though it was his original version in 1956 that got inducted in the blues hall of fame in 1994, for me it was Otis’ sixties take of his song that I commonly remember. And how my brother was able to capture that energy; solo on the bunk bed below… One thing for sure, it’s a great memory for me. If you are not familiar with Otis Rush, you can get more information regarding this amazing artist on his website. I think if you asked the question… What do Clapton, Hendrix, Bloomfield, Stevie Ray Vaughan, and Peter Green all have in common? The answer is they were all influenced by Otis Rush. Well I hoped you enjoyed another one of my little trips down memory lane? I could go on and on, but the idea is to get the readers of this blog involved in the discussion. So many of you have your own stories to tell… Please make sure you comment below. Thanks for bringing Otis Rush back to my attention. You’re welcome Mike… Glad you enjoyed that… He really is an amazing artist. Great jazzy blues instrumental performance. A consistent hit on our play list!